1. Belgian Medicott Terry Stretch Knit Pillow Top Cover Material: Hypoallergenic stretch top cover material offers incredible comfort. Pillow Flee: New age foam has a contouring plush feel of fiber while resisting the body impressions associated with fiber. 2. Super Soft Contouring Comfort Layer: Contours to the body for even weight distribution to eliminate pressure points. 3. Body Balance Multi-Zoned Support: Optimizes support physics & provides separately designed zones for head-to-toe comfort. 4. 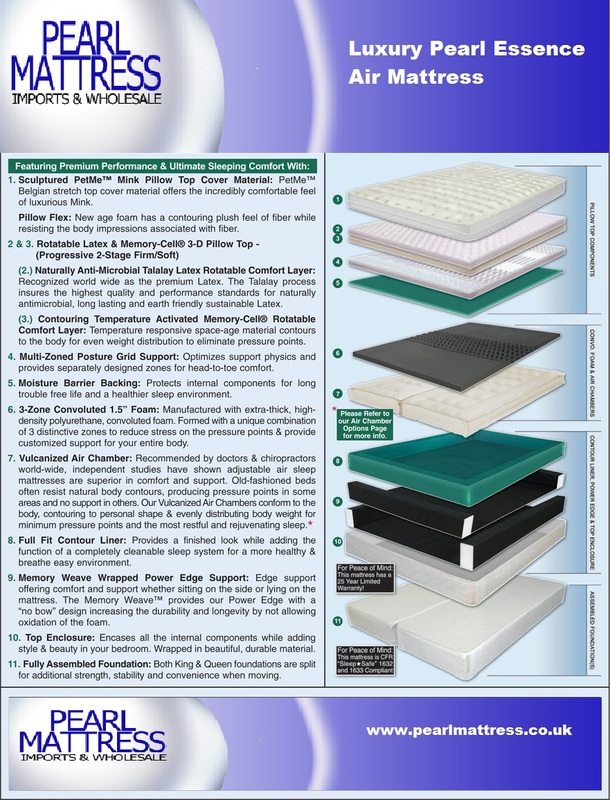 Moisture Barrier Backing: Protects internal components for long trouble free life and a healthier sleep environment. 5. 3-Zone Convoluted 1E" Foam: Manufactured with extra-thick, high-density polyurethane, convoluted foam. Formed with a unique combination of 3 distinctive zones to reduce stress on the pressure points & provide customized support for your entire body. 6. Vulcanized Air Chamber: Recommended by doctors & chiropractors world-wide, Independent studies have shown adjustable air sleep mattresses are superior in comfort and support. Old-fashioned beds often resist natural body contours, producing pressure points in some areas and no support in others. Our Vulcanized Air Chambers conform to the body. contouring to personal shape & evenly distributing body weight for minimum pressure points and the most restful and rejuvenating sleep..
7. Full Fit Contour Liner: Provides a finished look while adding the function of a completely cleanable sleep system for a more healthy & breathe easy environment. 8. Memory Weave Wrapped Power Edge Support: Edge support offering comfort and support whether sitting on the side or lying on the mattress. The Memory Weave provides our Power Edge with a no bow" design increasing the durability and longevity by not allowing oxidation of the foam. 9. Top Enclosure: Encases all the internal components while adding style & beauty in your bedroom. Wrapped in beautiful, durable material. 10. Fully Assembled Foundation: Both King & Queen foundations are split for additional strength, stability and convenience when moving.